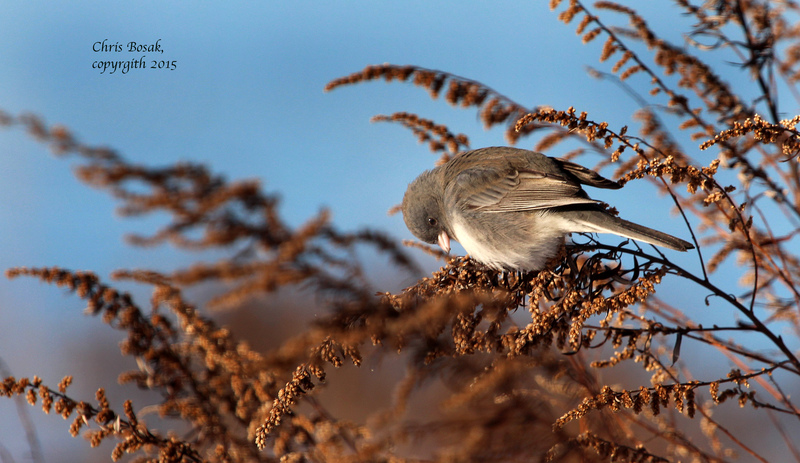 A junco looks for seeds on a dried up plant at Weed Beach in Darien, Conn., in Jan. 2015. 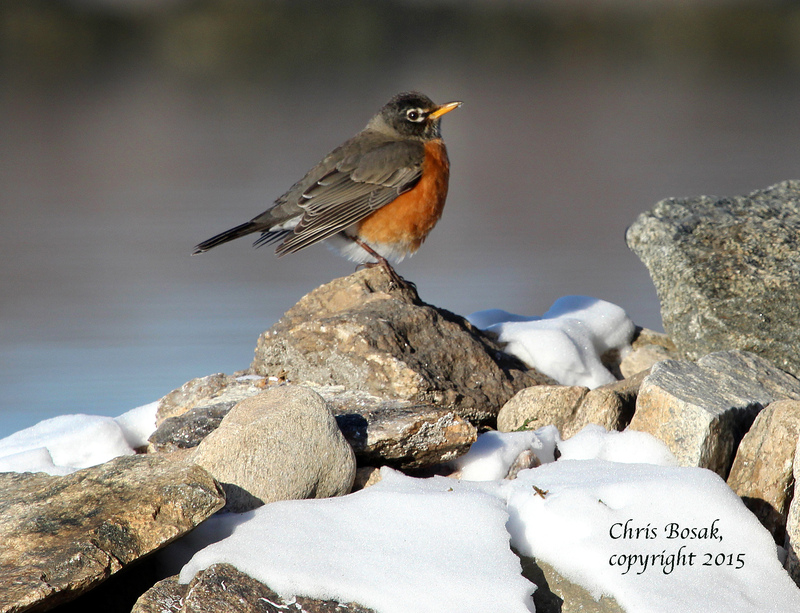 An American Robin perches on a rock at Weed Beach in Darien, Conn., in Jan. 2015. I dropped off my third-grader at school and faced a decision heading out of the parking lot: Take a left to the beach and see what birds might be there; or take a right and basically start my work day earlier than I have to. Of course I took the left. It’s a good thing, too, because there were some pretty cool birds down at the beach. Nothing too out of the ordinary, but some good photo opps of birds such as Dark-eyed Juncos, Horned Grebe, Fox Sparrow and American Robins. 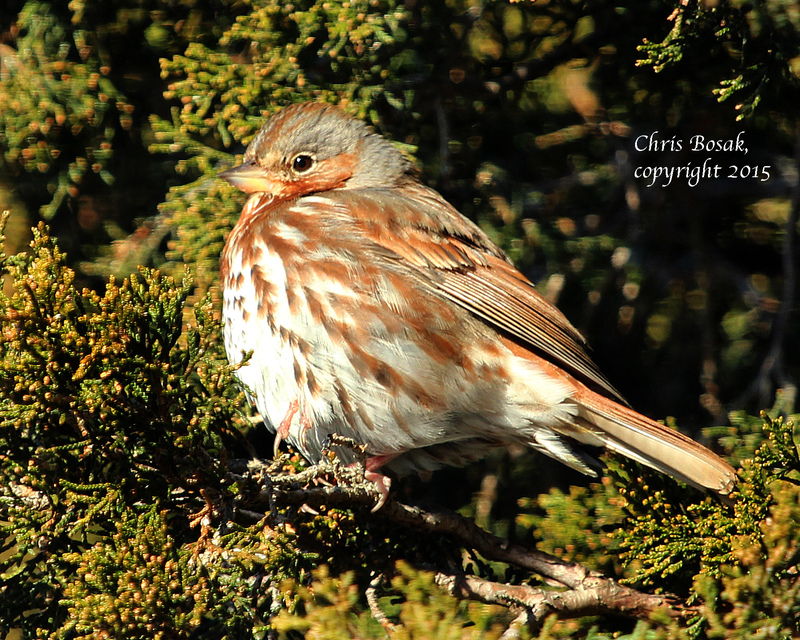 A Fox Sparrow perches in a cedar tree at Weed Beach in Darien, Conn., in Jan. 2015. It was one of those cold, but sunny days following a snow storm. The air was crisp, the snow still somewhat fresh and a clean smell lingering in the air. Some people have written to me this winter wondering where the juncos are. They haven’t been showing up under feeders as much as in previous years. The flock I saw on Thursday was very sizable. I wouldn’t worry about juncos. They’re still around. It was also the first Fox Sparrow I had seen in a few years. Some years they show up in large numbers, some years seemingly not at all, and some years here and there. There was only one Fox Sparrow among the dozens of juncos. Here’s a few more of the photos. 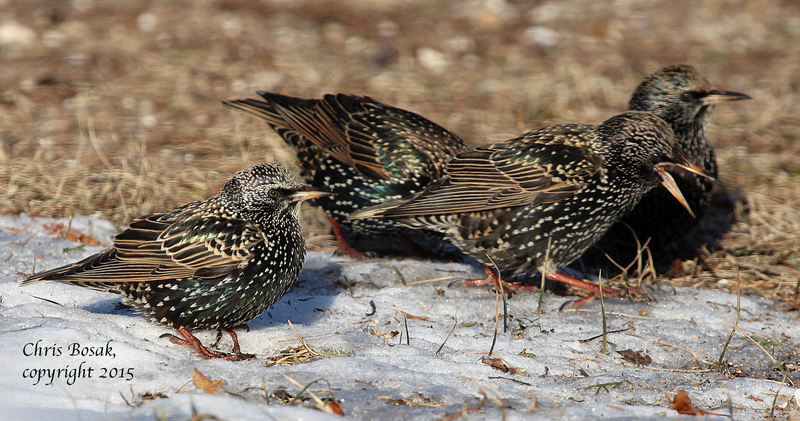 A group of European Starlings look for food among the snow at Weed Beach in Darien, Conn., in Jan. 2015. A Fox Sparrow scratches on the ground for weed seeds at Weed Beach in Darien, Conn., in Jan. 2015. 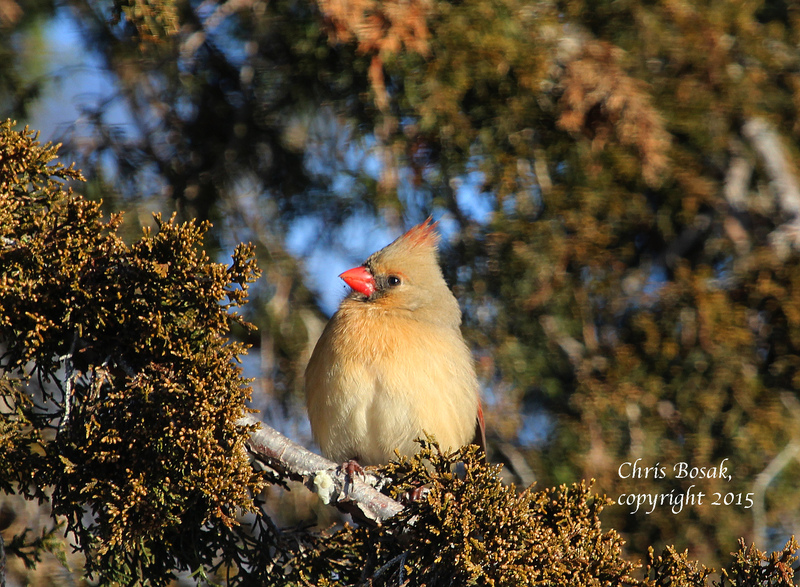 A female Northern Cardinal perches in a cedar tree at Weed Beach in Darien, Conn., in Jan. 2015. 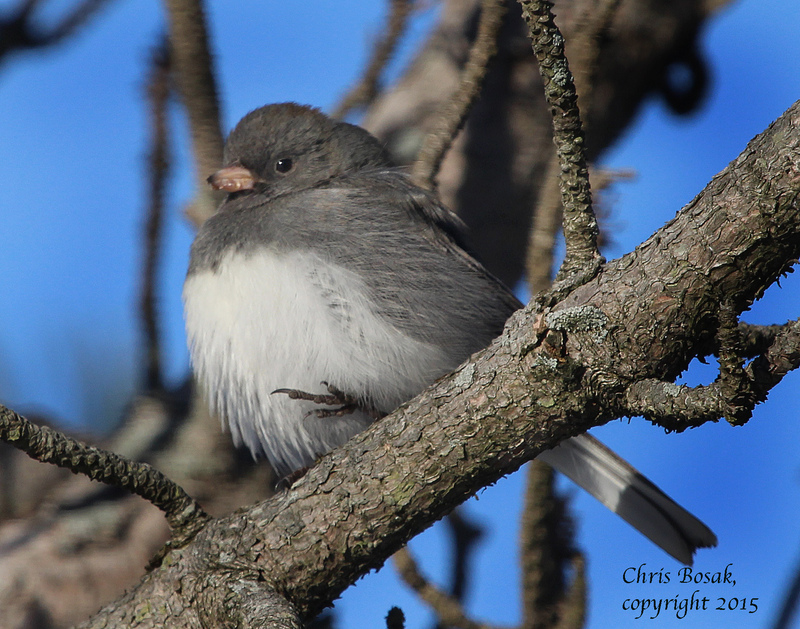 A Dark-eyed Junco perches in a tree at Weed Beach in Darien, Conn., in Jan. 2015. This entry was posted in new england birds, Random photos, Sparrows and tagged beach birding, Chris Bosak bird photographer, junco, junco in snow. 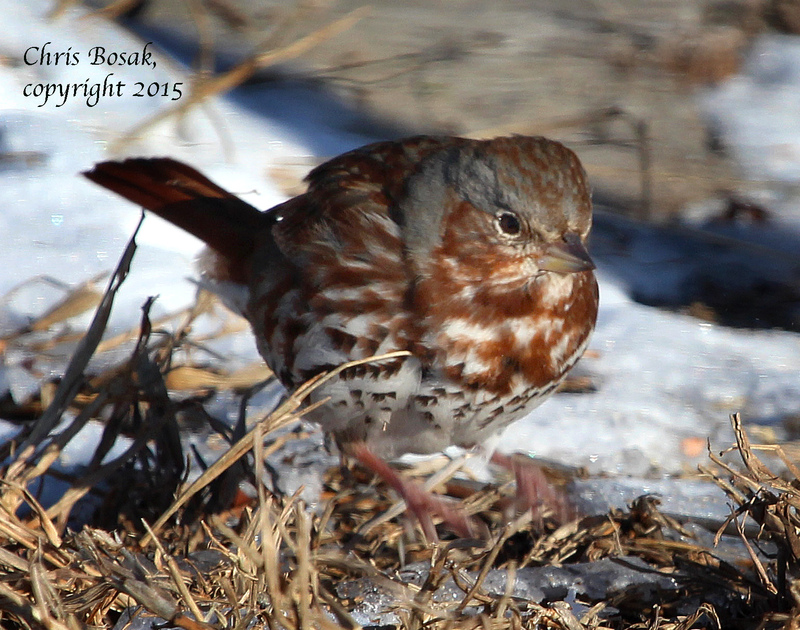 fox sparrow, photos of birds in snow by Chris Bosak. Bookmark the permalink. Still looking to get a clean shot of the Fox Sparrow. Is the Grebe still there? Hi Dave. I didn’t get back today to check it out. It was in the narrow strip of water between Stamford and Darien. I’ll let you know if I see it again. HAHAHA that would be so me! NEVER get to work early when there is nature photography to be had! Just gorgeous! Thanks Moments to Memories. Love your stuff, too. Love your photos. Thanks so much for sharing them. I’m curious about what you use for a camera and lens to get such clear, detailed photos. Keep up the great work!!! Thanks! I use a Canon body and Canon 100-400 lens. Not the professional lines (I wish, though), but even their more inexpensive lines are good. Thanks again for writing. I hope to get up to your farm one of these days.